School counselors, psychologists, and social workers now have access to an evidence-based and easy-to-use resource for helping students who exhibit symptoms of trauma. 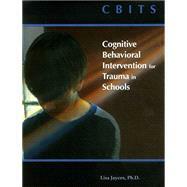 Developed in collaboration with the Los Angeles Unified School District Mental Health Services Division and pilot-tested with area youth, Cognitive-Behavioral Intervention for Trauma in Schools (CBITS) has produced positive results in young people suffering from events such as witnessing extreme violence, being in a natural or man-made disaster, or experiencing physical abuse. CBITS uses a skills-based, early intervention approach to relieve depression and anxiety. The program, only ten weeks long, consists of ten group sessions and 1-3 optional individual sessions. Students learn skills in relaxation, imagery, and social problem solving. Between sessions, they complete assignments and participate in activities that reinforce the skills they've learned. Professionals who work with students who are deeply affected by trauma know that these young people are more likely to fail in school, have problems forming meaningful relationships, and have difficulty finding success in life. The practical and positive therapeutic approaches used in CBITS foster the skills that young people need to cope with trauma and its aftermath.